Good Morning! Another snow day here, that would be # 4 for us down here in Frederick. I am not going to complain about Snow Days like some do because we will have to go longer in the summer, I don’t really mind it any way, and I will take what I can get! Yesterday was MLK day so I did some cooking. 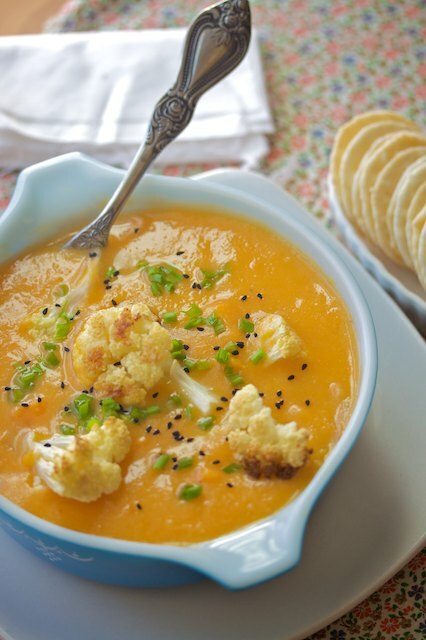 I made a delicious Cauliflower and Sweet Potato Soup that I found on Pinterest. It was a “clean” soup meaning there was really nothing but veggies, potato, water, and some salt. First, preheat your oven to 400 °F and cut up your cauliflower into bite sized pieces. Sprinkle cauliflower lightly with garam masala. Place cauliflower onto ungreased cookie sheet and lightly drizzle with olive oil. Place in oven and let roast until golden brown on the tops and tender, but not mushy, about 20-30 minutes. There’s no need to flip ‘em. Just remove from oven and let cool while you cook the rest of the soup. In large stockpot, bring sweet potato, onion, garlic and water to a boil. Salt (abt 3/4 tsp) and stir. Reduce heat and allow to remain at a constant simmer until sweet potatoes are tender. Add in cooked cauliflower and divide soup into 2 parts. Let soup cool and then blend one part soup in blender until very smooth. Combine with second part soup and stir. Salt to taste and warm up over stovetop if needed.